Hurricanes and Global Warming – Opinion by Chris Landsea | Watts Up With That? While I was looking into Chris Landsea’s recent activities, I came across a new essay that is a pleasant change of pace from the Climategate Emails. While it is definitely an opinion piece, and a wonderful example of how to disagree without being disagreeable, it’s also a great resource for our current understanding of hurricane hazards and activity over time. More than that – Landsea has some interesting attempts at adjusting the historical record to account for our increasing ability to spot hurricanes, even those that earn the title for less than a day. As a preamble, I definitely agree that global warming has occurred (around a degree F [or half degree C] in the last several decades at the earth’s surface). Also there is substantial evidence – in my view – that mankind has caused a significant portion of this warming through greenhouse gas emissions such as carbon dioxide and methane. I do not know whether the human contribution toward the warming is relatively small (~a quarter) or large (~two-thirds), but do agree that there is quite a bit of evidence that mankind is altering the global climate and will continue to do so in the future. … Thus there remains a large range of the amount of global warming to be expected in the future due to manmade changes in my view.) What does, then, a 1°F (0.5°C) ocean temperature change today and a potential 4-6°F (2-3°C) warming by the end of the 21st Century mean for hurricanes? All climate models predict that for every degree of warming at the ocean that the air temperature aloft will warm around twice as much. This is important because if global warming only affected the earth’s surface, then there would be much more energy available for hurricanes to tap into. But, instead, warming the upper atmosphere more than the surface along with some additional moisture near the ocean means that the energy available for hurricanes to access increases by just a slight amount. Moreover, the vertical wind shear is also supposed to increase, making it more difficult (not easier) for hurricanes to form and intensify. The bottom line is that nearly all of the theoretical and computer modeling work suggest that hurricanes may be slightly stronger (by a few percent) by the end of the 21st Century, even presuming that a large global warming will occur. The climate models are also coming into agreement that the number of tropical storms and hurricanes will not go up and may perhaps even decrease (by around one-fourth fewer) because of the increased vertical wind shear. … what does global warming imply for hurricane activity today? The ~1°F (~0.5°C) ocean temperature warming has likely made hurricanes stronger today by about 1%. Thus even for a Saffir-Simpson Hurricane Wind Scale Category 5 hurricane – like Hurricane Katrina over the Gulf of Mexico – the increase in hurricane winds are on the order of 1-2 mph (2-3 kph) today. What Does the Observed Increase in Hurricane Damages Imply? This section is hard to excerpt and has been covered well on WUWT. Landsea notes that hurricane damage depends on population density, per capita wealth, and coastal development. He notes that the Great Miami Hurricane of 1926 which cost $100 million in actual 1926 dollars would would normalize to about $165 BILLION today if it hit the same stretch of coast with today’s population and infrastructure. Has There Been a Doubling in the Number of Tropical Storms and Hurricanes? How Have the Ways We Measure Tropical Storms and Hurricanes Improved? After comparing what’s available today to meteorologists to what was available a century ago, Landsea talks about the ongoing effort to reanalyze the hurricane database. While he says “I am fortunate to assist with,” I think he spearheaded the effort after years of working with William Gray on Colorado State University’s efforts to come up with seasonal predictions. The shortcomings with the historical record were a significant nuisance. 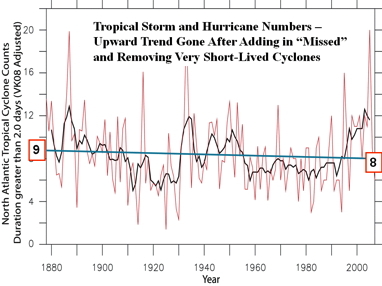 Landsea offers graphs starting with unadjusted numbers (seven storms per year on average in the late 1800s to twelve now) to numbers after shorties are removed, and then including an estimate of storms that would have been missed in the past. The trend flattens out with new values nine to eight. The remaining data still shows a variation in storm activity that Landsea, like Bill Gray before him, ascribes to the 60 year cycle of the Atlantic Multidecadal Oscillation (AMO). We entered a warm AMO phase in 1995 which coincided with the current period of high storm activity. How May Hurricane Activity Change in the Future? Landsea concludes the changes we can expect with significant warming are not major (the largest being a ~25% decrease in numbers of storms, offset by a ~3% increase in intensity – damagewise, I suspect that might be a wash). Knowing, however, when the cold phase of the Atlantic Multidecadal Oscillation will occur – and a distinct drop in major hurricane numbers – is unknown, but likely within the next decade or two. Is global warming a concern? Yes. We’re conducting an uncontrolled experiment where we really don’t completely know what the consequences will be. I’ve been particularly shocked about the drastic changes going on in the Arctic, with the huge ice cover loss in the summertime that may very well be related to manmade global warming. The biggest immediate worry I have is with the huge population increases of vulnerable coastal communities both in Florida, elsewhere in the U.S., and to our neighbors in the Caribbean. Such jumps in coastal residents are causing massive damage increases and, unfortunately, large losses of life such as the 10,000 deaths in Honduras and Nicaragua from 1998’s Hurricane Mitch and the 1200 people that drowned from Katrina in Mississippi and Louisiana. The confluence of more people and infrastructure with the current busy period for Atlantic hurricanes has me quite concerned today. But – in my opinion – the overall impact of global warming on hurricanes is currently negligible and likely to remain quite tiny even a century from now. It isn’t warmer than 1934. Period. That is a fabrication. He loses his credibility with the global warming nonsense. I agree that climate has warmed. I also agree that a portion of that MIGHT be due to human CO2 emissions. Climate warmed about 1 degree F in the US during the 40 years between 1895 and 1934. We weren’t emitting a lot of CO2 during that time. Annual temperatures cooled in the US in the 40 years from 1935 until 1974 by about 0.6F. Since 1975 temperatures in the US rose about 1.8F but this has not been a linear rise in accordance with CO2. All of that rise happened in the 23 years between 1975 and 1998 with half of it happening over one single year, 1998. Since 1998 US annual temperatures have declined a little over 1 degree F.
According to satellite temperature data from two different institutions using completely different satellites and equipment with two different methods of interpreting the data, there has been no warming globally since 1998. Sea level data from satellite measurement show a fairly linear rise in sea levels until late 2005 when it flattened out. There was another rise during the 2009/2010 El Nino event and it has since flattened out again. Sea level rise is not accelerating. That we are even looking those closely at tropical storm data is because of unfounded speculation by a crowd that would want to alarm us into a bunch of policy decisions based on that speculation that “global warming” would cause a great increase in the number of storms. That is basically why this article is here, it is refuting that premise. Climate varies. It always has. It warmed in the past without CO2. It has flattened today with CO2. In the US, annual temperatures are in rapid decline with winter temperatures declining the most. Winter US temperatures from 1998 to 2010 have fallen at a trend of -3.19F/decade which is a HUGE rate of decline and they have not “flattened out”, the rate of decline is roughly linear while annual temperatures are falling at a trend of -0.98F/decade and have flattened out the past two years, That would seem to indicate to me some sort of general circulation change is taking place but nevertheless, global temperatures have trended flat to slightly down since 1998. There has been no significant “global warming” (or even “climate change” either way) for the past 13 years. Even increases in global ocean heat content (0-700 meters) have flattened since 2004. It just isn’t happening. It just flat out isn’t happening. There doesn’t seem to be any correlation between rate of CO2 emissions and global temperature. We are probably within a degree of the temperatures seen before the LIA. We don’t have the perspective of having an instrument record as we went into the LIA to know if what we are seeing today. So far the only thing we do know for certain is that all of the math done so far on attempts to reconstruct previous temperatures is probably wrong and greatly suppressed both the LIA and the MWP (“A surrogate ensemble study of climate reconstruction methods: Stochasticity and robustness” http://web.dmi.dk/fsweb/solar-terrestrial/staff/boc/reconstr_reprint.pdf basically says both forms of RegM are junk for the sort of work they were trying to do for “The Cause”). The science is “settled” but in fact we really haven’t “settled” a thing. We know the Mann maths pump out a hockey stick at the end no matter what you feed it and now we learn that the handle is horse hockey, too. The whole thing is a “Chinese fire drill” for lack of a cleaner term. We keep coming back to the question of “for how many years must the observations deviate from the models before we declare the models to be invalid?”. Even this phrase in the lead in to this article: “Landsea agrees that the Earth has warmed over the last several decades, that greenhouse gases are to blame in some part, but acknowledges the sensitivity is not known. ” is what I call a “hockey mask”. It keeps you from getting your chops busted by the Hockey Team. People are so afraid of the Hockey Team (and apparently rightly so, as they tend to wield quite a bit of influence with various institutions and everyone appears to be scared to death to stand up to them) that they must always place this obligatory statement of accepting AGW before they rip another piece of the foundation of it to shreds lest someone attempt to have their doctorate revoked. Want to know what else? I am willing to bet there will be an increase in storms next year. Not from “global warming” but from upper atmosphere cooling that will make the difference in temperature between the surface and altitude greater causing more powerful convection resulting in more powerful storms. I’ve been particularly shocked about the drastic changes going on in the Arctic, with the huge ice cover loss in the summertime that may very well be related to manmade global warming. In summary, there is no reason to to be “shocked about the drastic changes going on in the Arctic” because there is ample evidence that it is in fact mostly unrelated to “manmade global warming” whatever that may be. I will even go a bit further and say that what we are up against is environmental terrorism. A huge portion of the population of the Unites States likes in regions where hurricanes strike. Texas, Florida, the Eastern Seaboard to include New York and even Boston are not immune to the impacts of tropical storms. Many people who live there have been through them, many with devastating memories or recalling the stories of their parents or grandparents. When people say that something is going to cause an increased risk of tropical storms, that means quite a different thing to a person living in Houston or New York or Miami than it does to someone in Denver or LA. The average person doesn’t know enough to weigh information given to them by scientists so they rely on government to filter it for them. Is “Joe Sixpack” ready to risk the lives of his children to stand up and say the “global warming” alarmism is just that? Probably not. And if his government says it is something he needs to go along with to keep his kids safe, then he does it. So these people use fear in order to manipulate policy. It has been their M.O. for decades now. Read “Fear Profiters” to learn how “socially responsible” businesses and organizations use fear in order to make millions: http://www.scribd.com/doc/54170138/Fear-Profiteers-1 (or download it at http://junksciencecom.files.wordpress.com/2011/04/fear_profiteers.pdf). These people are scaring the hell out of people and they telling them that if they just give up billions of dollars, everything will be OK. Well, what if it isn’t going to be OK? What if they are wrong? What if a hurricane slams right into them? Maybe it’s because they didn’t give ENOUGH money so they need even more. Maybe it’s curly cars instead of curly light bulbs and the politicians quickly send their kids out into the curly car business. It’s just plain old ordinary robbery. I mean, there isn’t enough data to support their claims, we are pouring billions of dollars of our hard earned into things based on little more than speculation and a computer model that doesn’t match observations. It’s just crazy. These people are basically terrorizing the people into forking over their money and it should be criminal. “likes in regions” should be lives in regions. What a pile of garbage – however, this is this fellow’s OPINION – now for some facts. In 1991 two Caribou hunters in Greenland stumbled on a Viking farm that had been buried in the permafrost for 500 years. The interesting question is why is a farm buried in the permafrost? The Middle Ages were warmer than the climate in the 21st Century. were higher than they are today. As the Vikings were not industrialised and no one has found a Range Rover with horns on the bonnet buried in the permafrost, the only conclusion is that the planet warms up and cools down periodically due to natural events. I don’t believe the projections of temperature increase towards the end of this century will be realized. Why? Because by then there will certainly be enough alternative energy from all the “green” sources (cold fusion, hot fusion, fission, geothermal, wind, solar, etc., etc.) to cause a significant reduction in fossil fuel use and, as a consequence, atmospheric CO2 will decline rather than continue its rise unabated. Helping to drive this transition is that fact that it is becoming increasingly difficult to extract carbon fuels from the earth due to economic, technological, and political constraints. As a consequence (and assuming CO2 actually is the culprit), I predict before we get anywhere near the year 2100 there will be a significant reduction in CO2 and other GHGs contributed by man to the atmosphere. I won’t be around to see it, obviously, but our kids and their grandkids will experience the outcome and, as they pursue the dream of clean energy from alternative energy sources, their lives will hopefully be devoid of the scare mongering and tax hiking crowd that have made a living off our current uncertainties and relatively backward ways (especially if we can find someone to continue exposing them in the fine tradition of WUWT). Why, in a few hundred years there may even be government programs designed to extract and burn fossil fuels in a clean, controlled manner simply for the sole purpose of enhancing the atmosphere with their life-supporting CO2. And the likes of Gore, Mann, Jones, Trenberth, Gillard, Suzuki, etc. can all spin in their graves from that eventuality for all I care. I won’t be spinning, for I will be pleasantly satisfied with the outcome. He loses all credibility as soon as there is a reference to models as if they predict certainty. The models predict a clear relationship between ocean and air warming? There also appears to be a total avoidance of the recent lack of warming and cooling. Instead he sticks to longer time frames. I would love to hear the “substantial” evidence that we are definitely warming the atmosphere in a significant way. As usual, the statement is made and there is nothing to back it up. Albeit cordial, it is still a waste of electrons. Does anyone else think it odd that nature caused the warming of the MWP, nature caused the cooling into the LIA, but humans caused the warming out of the LIA? I think some of the commentators judge Landsea a little harshly. This is a man who was forced to resign from his IPCC position because he would not bow to Trenberth and Jones ‘requirements’ for a chapter showing storms are worsening due to AGW. The work he published is very good, the conclusion is very clear. No doubt he knows he must phrase things very carefully in his published papers. But he sticks to his guns and gets the message across. I am sorry. I cannot understand how CO2 (or any “greenhouse” gas) has anything to do with warming the surface of the Earth. CO2 we are told, emits/absorbs over three bands of IR. 2.7, 4.3 and 15 microns. Those three bands will be working full time while the sun shines. What is absorbed does not reach the surface, thus the surface is shielded from the full effect of incoming solar energy. At night CO2 is only effective in the 15 micron band (look up Wien’s Law) and way under half is “backradiated” to the surface having a tiny impact on the NET energy flow. Now clouds DO REDUCE HEAT LOSS from the surface at night and REDUCE SURFACE HEATING during the day. Water, even as tiny droplets, has an emissivity of 0.99. The atmosphere is a ONE WAY heat pump. UPWARDS. Note the DRY ADIABITIC LAPSE RATE is not changed by the presence of CO2 or water vapour, H2O, which has a much wider range of emission/absorbtion bands than CO2 . Only condensing water vapour can change the adiabatic lapse to reduce the upwards rate of heat energy transfer but this still does not in any way warm the surface. REDUCING THE RATE OF HEAT LOSS IS NOT WARMING! “Greenhouse” gases help to reduce incoming sunlight energy and are thus overall COOLING AGENTS for the Earth’s surface. Well, the only problem I had was with the “hockey mask” comment. Well, that and the whole premise of the article in the first place. We wouldn’t even be having the conversation if they hadn’t used tropical storms to scare people into giving up their money. “Give us your money and we will make the storms go away. If you don’t, things are going to get very nasty but we can fix it if we get enough of your money.” is basically the message that the IPCC is sending to people. The rest of the article is ultimately “storms vary over time” and the current time isn’t a time with a lot of really bad storms. We kind of knew that considering we are now at a point where we are reaching the record number of days between Cat 3+ hurricane landfalls. There hasn’t been a Cat 3 or larger hit the US since Wilma in 2005. 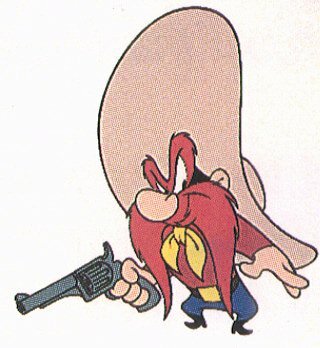 The IPCC tries to tell us we are going to cook, the ice is going to melt, the polar bears are going to die, storms will rip up our cities, our towns will be flooded, but it will be OK as long as we give up enough cash and convert our houses to running on bicycle generators and convert to Flintstone cars. I guess I’m getting old and cranky. My lighter is up. Nice summary of the quintessential skeptic’s position. The remaining data still shows a variation in storm activity that Landsea, like Bill Gray before him, ascribes to the 60 year cycle of the Atlantic Multidecadal Oscillation (AMO). As well as the AO, the PDO, the Arctic thaw and freeze episodes and the thermometer record; they all run in 60 year cycles: 30 up 30 down with a residue of up or down. Since the little ice age, that residue has been (over all) on the up. Probably many cycles exist (glacials and interglacials, stadials and interstadials), but the 60 year cycle is most obvious and can be confirmed by a glance. The parameters (a few) are likely the following: Solar system mass gravity pertubations modulate solar behaviour, which in turn modulates the atmosphere (probably in too many ways to count). And most interesting: salt cycles, which modulates SST’s and hence the ocean/atmosphere interface in a variety of ways. Atmosphere Co2 content is determined by SST’s. Any paper that starts with unsubstantiated nonsense statements such as ” … there is substantial evidence … ” , ” … but do agree that there is quite a bit of evidence … “, without stating clearly what such ‘evidence’ is supposed to be, is simply alarmist junk and does not derserve to appear on this forum. I’m sure if you have the smallest shred of actual evidence, your mates back at the IPCC would love to hear about it. I see that we are getting the slow re-focusing which is indicates that big organisations are starting to become aware that they have gone the wrong way, and need to pretend that they were right all along…. And some are still assuming that the discredited theory of GHG’s is valid. It is neither valid nor possible. Term “global warming” is a nonsense by itself. Most of the warming occurred in NH, almost nothing in tropics and South Pole is even slightly cooling in the last decades. Sure, if we mix all regions together, then warming in NH prevails and overrides neutral tropics and cooling South, but it does not mean that the warming is global. It is not. Most of the GW talk above is just belief. Give me data. This is a popular misconception amongst some sceptics. It is important to understand why this isn’t so. The greenhouse effect occurs because the our atmosphere is transparent to sunlight [i.e. transparent in the visible region around 0.5 micron]. This is why we can see the Sun – and the moon and stars for that matter. The atmosphere does not absorb radiation in the visible region, which is where the Sun’s output is concentrated, and so solar radiation reaches the Earth’s surface unhindered and warms it. The outgoing radiation from the heated Earth surface peaks around 10 micron. See diagram of respective spectra. Note that there is no significant overlap between the wavebands of the incoming solar radiation and the outgoing long wave infrared. Now CO2 absorbs radiation strongly between 14 and 16 micron ( forget the 2.7 and 4.2 micron bands, they play no part in the greenhouse effect). Notice from the above graph that a substantial proportion of the Earth’s radiation falls within the CO2 absorption band. Notice also, that none of the Sun’s incoming radiation is within this band. Thus, while the CO2 absorption band blocks the Earth’s radiation that is trying to escape, it doesn’t shield us from any insolation. Some of the energy absorbed by the atmospheric greenhouse gases is then radiated back to the surface where it represents an additional heating flux. But perhaps that’s a step too far, let’s understand the basics first. Could someone please, please tell me what this “substantial evidence” is? I’ve been looking for several years now and all I’ve found is nonsensical claims that are completely misleading or even fraudulent. The sun radiates all frequencies. It is a blackbody radiator. CO2 is most definitely absorbing at 2.7 and 4.3 as well as the 15 micron band. The energy in the 2.7 and 4.3 bands is far higher than for the 15 micron band. 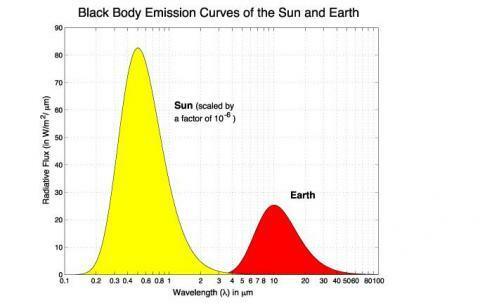 I agree surface radiation at night is too low to effect the 2.7 and 4.3 bands. “Back radiation” is not the correct term for NET radiation. Suppose we assume that there is, for the globe, x amount of energy available for the processes in the weather. What if the position of the energy becomes “distorted” in other words suppose the need for tropical cyclones is less, because there is already a reason for them not to have to develop, ie more heating ( energy) in the northern latitudes, without a corresponding increase in energy in the hurricane areas. The idea is that a certain relationship between the temperate regions and the breeding grounds must occur to force development. But here is where the global warming comes in. Say tropical breeding ground water temps stay the same or rise very little, but there is much more rise in the northern areas. What is the need for storms to take energy out of the tropics and redistribute it in the temperate regions, if it already has been done? By this logic, there is a chance that so called global warming can cause less activity since it distorts the ideal pattern for focused accumulation of energy in the breeding grounds, that then must be redistributed! But the rise in northern temps is probably offset by subsequent cooling, as we are seeing now in the tropical pacific with the reverse of the PDO as far as the energy aspects of what a saturated parcel of air means at a given temp. The dirty little secret is that a drop in the wet bulb of 1 degree F at 80 degree has far more implication to the energy of a parcel of air, then the same parcel over a dry climate at 20 below 0. But tropical cyclones are “delicate” as far as how they function, it takes a series of aligned circumstances to produce them in abundance. Disruption of this, even if it is with “apparent” warming, could cause the disruption in the ideal energy pattern globally to produce the major down turn. not as significant as the return of the pattern in the Pacific to one that breeds more storms in that area of the world, specifically the southwest tropical Pacific. The atlantic will return to the 60s and 70s but ace activity globally will go up. around the northern ice cap, since it is almost surrounded by land with responds to the warming and cooling of the ocean in the northern hemisphere more, hence the response in the time of the warm pdo and the predicted response in the coming years. So the increase in ice around antarctic and the profile of the ocean in the warm pdo, which is cooler south of 40 south in the warm pdo, argues that the cumulative increase in energy in the north over dry land land that the increase in temp of drier air represents, is offset by the fall, slight as it may seem, of the water around the southern ice cap. There is no change in the total energy of the system ( this was my argument that got people to attack me over) and there is no buildup of energy in the lower troposphere being caused by co2, there is no trapping, that this is not a greenhouse as is commonly referred to, but a thin flimsy veil surrounding the earth that agenda driven types wish to portray as some kind of trapping mechanism that will somehow destroy a process that the earth readily adapts to through a cyclical pattern. There is simply a natural cyclical pattern that develops to respond. Distort for a time that pattern via too much warming in one place and cooling in another and there is a response in the observed features that can tell us that. accumulating to cause the need for heat to get redistributed, then the ace would not have dropped and the southern ice cap, would have contracted also, since it would have meant that the waters there over the years we have measured via satellite would have held steady or warmed. The apparent rise in global temps will soon correct ( relatively speaking) and the ace index returning to normal over the coming 10 years will coincide with an observed drop in global temp in the jagged up/down fashion we saw it come up, the northern ice cap will start its recovery, the southern ice cap start its retreat a bit. It is a matter of where the energy relative to what TEMPERATURE REALLY MEANS, and that is not a linear relationship. The fall of the ace index may simply be this message, the earths energy distribution due to “global warming” is distorted. The earth will correct that and as it does, it will prove the cyclical nature of the climate. In a way what is being observed now indicates to one that refused to look at what a measure of temperature really means, that there is some warming, when in reality it is a simply the earth in a natural cycle. Incidentally, as it corrects and cools, in the north, there will be an increase in the ace, which of course will then be attributed to global warming. One more thing, just one example of distortion and reaction. Think about the years when the worst winter storms in the temperate regions near the US occur. Its when there is blocking, warming in the polar regions. THAT DISTORTS THE PATTERN TO PRODUCE THE UPTICK FURTHER SOUTH Why? if overall there is no change in the energy from the equator to the pole and there is a buildup of heat in one place,there is a corresponding decrease in another. DISTORTION of the pattern is the key folks, but it does not mean that there is a change in what is available in the overall pattern. Once the pattern that set in motion the abnormal storminess is corrected, then the process returns toward normal. There is nothing mysterious about nature simply reacting… to nature! We see it all the time.and I suspect the smoking guns of the climate can be found in the “meaning” of the ace index and the cause for the fall while we are apparently so warm ( its distortion of the global temp) which will correct itself in the coming years. The test of the theory will be to watch the global temps, the ice caps , and the ace index. All they are doing is searching for a balance they can never have, simply because of the nature of the creation! In the end, for those that love the majesty of the atmosphere, as helpless as we all are to change it, the challenged provided are truly a wonderful gift for the curious and objective among us. In the end, there is nothing new under the sun, there is no buildup of lower tropospheric heat when one considers what heat really is, and the problem is we measure temps in a form where 1 degree in the arctic is given the same importance as 1 degree in the tropics. Events such as hurricanes and icecap increase and decrease are simply the reaction to the earth using what it has, and us now being able to observe it. Much more than that. They’ve missed out the Water Cycle altogether, (why we have all these silly radiation/backradiation arguments and no convection heat transfer). The Earth with our atmosphere of mainly nitrogen and oxygen, but without water, would be 67°C, not the 15°C it is. There is a convoluted sleight of hand going on here produced from the AGW science fiction department. All they have done is keep repeating that “greenhouse gases warm the Earth” and when pushed say without them the Earth would be -18°C – but, that is the figure given for the Earth without any atmosphere at all, in other words the ‘warming’ from that is actually including oxygen and nitrogen as greenhouse gases. And as George E. Smith pointed out here: http://wattsupwiththat.com/2011/11/28/senior-ncar-scientist-admits-quantifying-climate-sensitivity-from-real-world-data-cannot-even-be-done-using-present-day-data/#comment-813072 they actually then attribute the whole of the 33°C rise from -18 to +15 °C – to carbon dioxide. This is convoluted because they have done several strange things within the telling of their story. It’s not easy to disentangle. It certainly requires someone with better skills than I have to put this into simple descriptions to separate out the science fiction deliberately manufactured confusion and real world physics, and the varieties of explanations given to perpetuate the meme that ‘greenhouse gases warm the Earth’. What Ira has done is claim the -18%deg;C is the temp of the Earth with nitrogen and oxygen, but that is the figure without them. Let’s look at how greenhouse gases influence the climate system, and how they might cause climate change. The ideas below come from George Philander’s book, Our Affair With El Niño, chapter 7: Constructing a Model of Earth’s Climate, page 105. If earth had no atmosphere, if it had a land surface that reflected some sunlight like the real earth, and if it were in equilibrium with solar heating, the average surface temperature of earth would be -18°C (0°F), far colder than the average temperature of our earth, which is 15°C (59°F). Worse, the surface would cool down to around -160°C (-250°F) soon after the sun set because the surface would radiate heat to space very quickly, just as the moon’s surface cools rapidly as soon as the sun sets on the moon. If the earth had a static atmosphere with the same gases it has now, but with little water vapor and no ocean, the average surface temperature of earth would be 67°C (153°F). This is much warmer than our earth. The planet would be so hot because greenhouse gases in the atmosphere help keep heat near the surface, and because there is no convection, and no transport of heat by winds. Adding winds cools the planet a little, but not enough. Even here, where we do get the temps including the Water Cycle, he has to bring in the bloody meme again, that ‘greenhouse gases keep the Earth heat close to the Earth’, regardless that he is describing an atmosphere of nitrogen and oxygen without water vapour! It’s that meme we have to get rid of, the rest, I think, will then fall into place. Greenhouse gases do not warm the Earth, they cool it, as you’ve said. Without the main greenhouse gas water vapour the Earth would be 52%deg;C hotter! What possible difference does a piddling amount of CO2 make against that immense power of water vapour? Of course it doesn’t, and it’s obvious it doesn’t when the actual real world role of water vapour is included. That’s why they have to exclude it, to exaggerate the role of carbon dioxide, and push the idiotic backradiation.. Including the Water Cycle, all pure rain is carbonic acid, because carbon dioxide and water vapour spontaneously combine in the atmosphere to form this. Carbon dioxide therefore rises with heat and with water vapour combines and cools and comes down in the rain with it, and in fog and dew and so on. This is a dynamic system, not the static one dimensional fictional world of ‘radiated energy whether thermal or not creating heat’. Greenhouse gases cool the Earth. That is the only meme worth repeating to cut through this fictional science. An inconvenient fact from logic: a false theory may have true consequences but a true theory cannot have false consequences. Thus, while the CO2 absorption band blocks the Earth’s radiation that is trying to escape, it..
And there you have a quandry. At what atmospheric concentration of CO2 in ppm is it absorbing 100%? Was it doing so at 300 ppm? (That’s a heck of a lot of CO2 when you consider the thickness of the atmosphere.) I believe it was absorbing 100%. So the question is: Can you get greater than 100% absorption? No, that’s obviously impossible. So if 300 ppm CO2 absorbs 100% of outgoing radiation, what difference will increasing the atmospheric level of CO2 to 400 ppm make? Great article, Richard, and the reason none of “The Team” are recognized physicists, astronomers, and astrophysicists–or else they wouldn’t continue to perpetrate this CAGW boondogle. Sorry, there should be a close italics after: And as George E. Smith pointed out here: http://wattsupwiththat.com/2011/11/28/senior-ncar-scientist-admits-quantifying-climate-sensitivity-from-real-world-data-cannot-even-be-done-using-present-day-data/#comment-813072 they actually then attribute the whole of the 33°C rise from -18 to +15 °C – to carbon dioxide. Again and again we find a 60-year cycle in the climate system. and Solar-Terrestrial Physics, DOI: 10.1016/j.jastp.2011.10.013. C. Loehle and N. Scafetta, “Climate Change Attribution Using Empirical Decomposition of Climatic Data,” The Open Atmospheric Science Journal, 5, 74-86 (2011). A. Mazzarella and N. Scafetta, “Evidences for a quasi 60-year North Atlantic Oscillation since 1700 and its meaning for global climate change,” Theor. Appl. Climatol., DOI 10.1007/s00704-011-0499-4 (2011). In fact I think they stimulate the cooling effect of a faster/larger water cycle to mostly or completely offset the warming effect of GHGs. At its most simple, GHGs retain energy in the system a fraction longer but the system response via the water cycle is to speed up the energy loss by just about the same amount for a zero net effect. If 300 ppm absorbs 100% of the outgoing radiation, wouldn’t a concentration of 400 ppm provide for additional absorption (buffering?) capacity? What about 500 ppm? IT IS NOT CO2: In the name of CO2, many are making Millions of $$$S. The Climate War will be won by those who have Oceans & Seas Analysis. I was furtunate to work in a place from 1981 to 1997 as a Heavy Duty Desalination Operator & got some study meterials from Glaxco University’s Desalination Engineering. From 1995 onwards, International Desalination Association ( IDA ) World Congresses on Water & Environmental Protection published my papers. Abu Dhabi Water & Electricity Department did not like my writings & instructed to withdrawal of PAPER at 1997 IDA, Madrid, SPAIN World Congress.As I objected, I was finished from the job. Due to uncertainties I did not work in that feiled since then & continued my studies, Research & Developments with the supports of my UAE friends. I had submitted a 45 pages paper to 2009 Dubrovenik Conference& did not published it as I did not presented ” Mushrooming of Desalination Systems in the M.E. & Environmental Desasters Around the World”. During September 2009, with a two page letters through e-mails challenged Environmental, Climate & Global Warming Scientists, but non of them replied. Now I am publishing a book in USA ” Environmental Rapes & H.R. Abuses Lead to Climate Change Control” ( Full color- 500 pages). IT WILL SOLVE GLOBAL WARMING. He lost me the first three paragraphs in…. no confidence in the rest (not that I have any confidence in any of the science around global warming of any form). On dear, you can lead a horse to water but you can’t make it drink. You refer to an article by Mr. Postma, which doesn’t say anything at all about absorption at 2.7 or 4.2 micron. so I suppose you couldn’t understand it or didn’t bother to read it yourself (Good Move). Unfortunately, probably in common with other physicists, I find Mr. Postma’s meanderings impossible to follow too. If ever I learn anything from the likes of Mr. Postma you will be the first to know (don’t bother to leave your contact details – it won’t be necessary). Does it absorb all radiation in this region? Well, it absorbs most of it. Would increasing the amount of CO2 cause it to absorb more? Yes, but the effect of CO2 is logarithmic, that is one of diminishing returns. Let me try to explain it like this…. Imagine painting a window in order to block out the light. The first coat of paint will block out most of the light, but still some will get through. So you add a second coat of paint. This blocks out most of the remaining light. But you can still tell if it is light or dark outside. The first coat of paint had a big effect. The 2nd coat had some effect but each successive coat has less and less and less effect. This is the same with CO2 blocking infrared. Most of the warming you are going to get from CO2 in the atmosphere we already get. Adding more now will have only a marginal effect (all other things being equal). The existing greenhouse gases keep the world about 33 deg.C warmer than it would otherwise be, and thus make our world habitable. There are formulae to calculate how much extra heating would be produced by increasing CO2 concentrations. For a doubling of CO2 this would be about one degree (this is called ‘climate sensitivity’). Note that this is not in itself catastrophic, probably beneficial, but it does assume that nothing else changes, i.e . there is no positive feedback. The trouble is gentleman, that there are some opinions which challenge the established science of the past century, the science which has made our modern world what it is. Some of this obviously appeals to the scientifically illiterate, no doubt its target. But I believe that regurgitating this nonsense only does damage to the sceptic argument.Don’t lend yourself to this. Wow!! That pretty much sums it up for me. Where do people get the idea that CO2 absorbs ALL upwelling radiation? IT DOESN’T! If the surface is radiating at 400 watts per square metre the CO2 in the atmosphere above can only absorb some 2% of that energy in the 15 micron band. The total range of the upwelling radiation covers from about 3 to 50 microns and above. Most of that radiation absorbed in the 15 micron band warms the atmosphere. Half of whats left might re-radiate and reach the surface but the intensity is so low it will have no effect. Increasing the amount of CO2 does not change the amount of energy absorbed. The line broadening warmists talk about can only be seen in laboratory experiments where CO2 is heated to over 1,000C, a most unlikely temperature on the Earth’s surface. Increasing the amount of CO2 does not change the amount of energy absorbed. Excuse me? Oh, I get it! There are only so many photons for the CO2 molecules to absorb at a given wavelength. Silly me! That is true if you measure at the SURFACE. If you measure from a satellite outside the atmosphere I believe you get a different story. The reason there is no such overlap at the surface is that the atmosphere blocks those wavelengths from the sun. The sun DOES radiate in those wavelengths it’s just that the atmosphere blocks radiation in either direction, from the sun or from the surface. So CO2 doesn’t care from which direction the radiation comes, it just blocks it. So it is as effective at blocking the radiation from the sun as it is in blocking it from the Earth. CO2 (and H20) absorption of IR isn’t directional. But (and please say so if I am incorrect) it is my understanding that the atmosphere is already opaque at the CO2 bands of absorption anyway so adding some more isn’t likely to change that opacity. You can’t measure at the surface and tell what “incoming solar radiation” looks like. You have to measure that from outside the atmosphere. I can help Chris out with some simple logic here. Then the positive phase of that natural variation must have been responsible for half the late C20th warming, disregarding other factors. Therefore, since at least half the co2 increase is natural anyway, the human contribution can’t be more than a quarter, or about 0.1C. I’m not commenting on this paper – I haven’t read it. I’m commenting on Chris Landsea. I did some independent work on the subject of hurricane frequency and severity a few years ago. In the course of my work, whcih included considerable background reading, I concluded that papers by Chris Landsea were logical, well-researched and worthwhile. I no longer read anything by Trenberth et al. http://scienceofdoom.files.wordpress.com/2009/11/blackbody_curve-sun-earth.jpg You can see that there no ‘absorption’ gaps in it. If you compare that with actual measurements outside the atmosphere, it is a close approximation .see following graph for measured values. 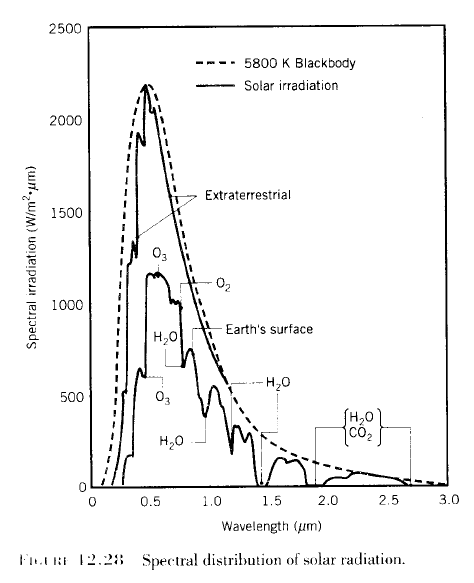 This graph shows (dotted line) the theoretical radiation from a blackbody at 5800K ( the effective temperature of the Sun surface). The solid line (marked extraterrestrial) closely following the blackbody curve is the actual measured insolation at the top of the atmosphere (TOA) as measured by satellites. A very good fit, so I think you will agree that measuring outside the atmosphere gives more or less the same story. The solid line inside this is the insolation measured at the Earth’s surface, showing depressions due to absorption by various atmospheric gases. In either case, note that the incoming solar radiation falls to almost zero at 3 micron, so there is no significant overlap with outgoing long wave radiation from the Earth, which peaks at around 10 microns.. Although the curve seems to hit zero at 3 microns, it is actually continues to decrease to infinity (i.e it’s asymptotic) so Richard111 is technically correct when he says “The sun radiates all frequencies”. Yep,,,you probably missed my answer above at 7:38. If you want a fuller answer, I would recommend …..
Moderator, please replace my previous post with this one, which has been spell-checked. In the course of my work, which included considerable background reading, I concluded that papers by Chris Landsea were logical, well-researched and worthwhile. Appeal to authority; trust us, we are scientists. We wouldn’t lie to you, never ever. The trouble is, Bomber_the_Cat, we HAVE been lied to and can prove it. Quite right. He does not mention 2.7 or 4.2 micron. It was reading the chapter “The Realistic Terrestrial System Model” on page 34 that made me realise radiation from the sun reaching the top of the atmosphere providing a solar flux of 1370W/m^2 at 394K or +121C must also contain ALL BANDS of radiation at the same proportion which originated from the sun at some 5778K of blackbody radiation. Thus CO2 in the atmosphere MUST be absorbing at 2.7 and 4.2 and 15 microns and consequently shielding shielding the earth below from most of the energy in those bands. I say again, carbon dioxide in the atmosphere provides MORE cooling than warming. We all know the surface radiates upwards at about +15C. CO2 is most effective when the sun is shining. This is entirely my thinking. Mr Postma enlightened my thinking. I have a printed copy of his paper at my side as I type. I use it as a reference. It has some excellent basic physics on the atmosphere. May I suggest you think before you cast aspersions. Yes, this is an important point that few are aware of. shows a .006 K/C per decade decrease. I am not aware of a compelling explanation for this significant divergence in temperature trends between the poles. Please note the graph indicated above is scaled DOWN by a factor of 10^-6 for the sun graph. Assume the vertical scale is in centimetres, multiply by 1,000,000 and you get 83,000,000 centimetres, that is 83 kilometres. A rather large sheet of paper is needed to show both graphs on the same scale. So the level of radiation at 3 micron is most certainly NOT approaching zero. Re: my post about the sun graph above: since when, for any blackbody temperature increase, does the longwave energy level REDUCE? Radiation at 10 microns from a 5,000K source has to exceed the 10 micron radiation from a 300K source. Some people here really need to review their understanding of basic physics. Please do us the courtesy of responding to the questions that have been put to you regarding your article. Perhaps you find it too embarrassing trying to back up your alarmist statements ? We all know there is no evidence whatsoever for man caused global warming, don’t we ? It has been warming since before the 1800s and manmade CO2 emissions were not responsible for that warming. This largely seems to be side stepped by ‘the Team’ on the basis that their models cannot explain the warming that occurred post 1940s without using CO2 even though the rate of warming as from 1940 onwards is no greater than the warming between 1910 to 1945!!! A third of the warming attributed to AGW happened in a single year. I wonder what they attribute that to. Well, I found his discussion on Hurricanes plausible and interesting. As to the global warming things that seems to get everyone steamed, i understood that most skeptics accepted that the climate has changed just not the why. For my part, i have no doubt that the climate has changed since, the 1974/6 step change, which was ushered in by a big La Nina. After that I don’t know. Mr Landsea it hasn’t warmed for the past 16 years, and it wasn’t a particularly warm half-cycle when it WAS warming. It’s a well known fact Phil Jones and friends ALL have a ‘true’ global temperature in mind – the temperature reflected by the RAW DATA, UNADJUSTED, placed online by LAW to stop WEATHER SCAMMING. Your claims of there being any evidence at all of correlation to manmade, or even ANY CO2 and temperature, are really only – what? Evinced, I mean, where? Not ‘maybe’ ‘partially’ this is simple science: there’s a giant heater IN the SKY binary 1 or 0? Well, we STILL have ZERO tropospheric hotspot MANDATORY to G.H.G. Hypothesis. We STILL have ZERO RISEN ATMOSPHERIC IR DOWNWELLING: M.A.N.D..A.T.O.R.Y. to there being EVEN a G.H.G. Effect AT ALL, as with the tropo/hotspot. So really whatever it is you’re talking about, the entire panoply of human instrumentation has been DESPERATELY SEEKING that giant heater for 20 YEARS, and so far not ONE experimental plane, not ONE military plane, not ONE plane ANYWHERE and not ONE set of WEATHER INSTRUMENTS ANYWHERE has repeatedly detected a heating, upper portion, LOWER troposphere. So that means that to me, PHYSICS is a WIND-UP toy and the fact not ONE INSTRUMENT on EARTH – even OPTICAL TELESCOPY – can show EVIDENCE of RISING ATMOSPHERIC SCINTILLATION – ALSO MANDATORY to your G.H.G. Hypothesis. GHG Hypothesis SAYS that there MUST be MORE atmospheric SCINTILLATION: the STARS TWINKLING HARDER Mr Landsea. Because HEAT in AIR is MOTION. HEAT on GAS is MOTION. And we KNOW what they say. It was the main reason I became suspicious. That and I grew up during the 60’s and 70’s when the same crowd was screaming about “Global Cooling” and a coming Ice Age. At least they got that right, though no one knows the exact timing. ….. and so solar radiation reaches the Earth’s surface unhindered and warms it. The outgoing radiation from the heated Earth surface peaks around 10 micron…. Bomber_the_Cat, We are very well aware of that. We are also well aware of the elephant in the room. That elephant is H2O and stomps all over the tiny ant called CO2. It is why H2O is conspicuous by it’s absence in the IPCC list of Greenhouse gases. There is also the fact that CO2’s “green house” effect is logarithmic So most of its effect has already been “felt” In otherwords CO2 has already shot its wad and more increase in CO2 will have even less effect if any. And that is before you get into the second law of thermodynamics and whether the cool air can warm a hot earth. BTW most of us see water in all its phases as the main actor on climate and not an insignificant gas. 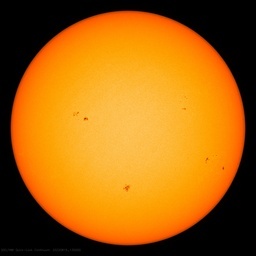 The big question is where does the variability of the sun fit in and is it a major player? I rather have him spout the nonsense and then present data that SHOWS it is nonsense than have him replaced by a Hansen or Mann and get data fudging that shows what the priests of CAGW want. Severe note to self – do not, repeat do not attempt playing with numbers before breakfast! The 83 kilometres is correct. I fooled myself with my typo 83,000,000. Should be 8,300,000 centimetres. I always feel so embarrased when I make a boo-boo on this blog, I get twitchy and make it worse because I can’t edit my mistake. Gail — You make a valid point. I hope this was his intent. Ahhh, a loverly, long dose of sanity. Thangkew. 2) J. Cao’s paper here: http://www.tech-know.eu/uploads/JCao_N2O2GreenGases_Blog.pdf notes that the only gases capable of radiating energy into space are the “GHGs”, so net-net they must be responsible for cooling the atmosphere.